After a career in accounts management, Sevi Stolica cooked up a great idea for a business. Inspired by a fussy toddler Sevi developed Baby Bistro, a quality range of organic home-made and home delivered dishes. Thanks partly to the Small Business Mentoring Service, the idea quickly took off and attracted TV and radio personality Chrissie Swan. Baby Bistro sells a range of frozen organic baby mains, starters, sweets, cereals and snacks online. The hand-made dishes come in smooth or chunky and are home delivered. Each meal is made with fresh certified organic fruit and vegetables. Ingredients are free from chemicals, additives and preservatives and have no added salt or sugar. Mains come in delicious 200g serves in flavours such as red lentils and vegetables, sweet vegetable chicken and chia, beef and risoni and cheesy fish with broccoli and cauliflower. Snacks include freeze dried apple pieces, organic sultanas and teething rusks. Baby Bistro’s core values are to ensure its products are naturally organic, delicious, offer variety and are quick and convenient. “Our children deserve the best start in life and as parents it’s up to us to make the right choices,” Sevi says. Baby Bistro was inspired by Sevi’s son Lucas, who was born in 2010. “When he was old enough to start eating solid foods, I quickly discovered what a fussy eater he was,” she says. While Sevi loved cooking and had experience working in a cash management role, she wanted help to ensure she set the business up and ran it professionally. “I wanted to ensure I was making the right decisions where I was unsure,” she says. She also wanted to make the most Baby Bistro’s strengths, which included the health of the product and its convenience. “I love cooking and wanted to do it professionally,” she says. When she was preparing to open the business Sevi, who recently had another son, Thomas, discovered SBMS. She contacted the service and was matched with mentor Susan Bajada. Now working in marketing and PR for MOONTASTIC, Susan Bajada has had wide and varied experience in a number of industries. Susan owned and managed two restaurants in Sydney, as well as a Melbourne based catering company. She also operated a sales brokerage firm and has HR, management, marketing and sales experience. Ways of getting celebrity support. Among other things Susan recommended that Sevi, who already had a commercial kitchen and had begun preparing frozen meals, use social media. Susan said she should also issue a press release as her product was unique and of interest to the huge baby food market. Sevi took her businesses to facebook and twitter to broaden her audience and ended up with praise from radio and TV star Chrissie Swan, who loves the convenience of Baby Bistro. 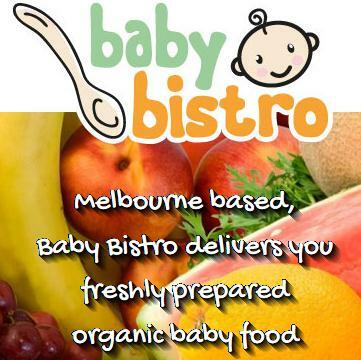 When it launched, Baby Bistro was the only business in Melbourne making organic baby meals by hand. It sells locally but Sevi hopes to expand into other states. She has two assistants and hopes to increase this as she expands her range and coverage area. Sevi is working on a toddler range and hopes to eventually sell fresh meals as well, concentrating on seasonal organic produce. Sevi said Susan helped give her the confidence to develop her business and to try new things. “I was able to make moves I would not have thought of,” she says. Susan says Sevi was very keen and had the confidence to act on her advice and think outside the square.